Something for cider and perry enthusiasts to enjoy. Not only a selection from some of our best independent orchard producers, but an eggstra special bonus and an orchard friend. SKU: glos1010. 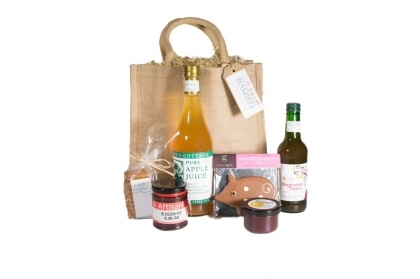 Category: Orchard Hampers. Jolter Press, Browns Apple Cider, 500ml. A medium sweet sparkling cider from this Mitcheldean craft cider producer. Characterful applies to the cider as well as the producers. Check out their link on our producers’ page for a treat of a read. Ragged Stone, Cider, 330ml. This independent producer uses a variety of traditional cider apples including Yarlington Mill, Kingston Black and Herefordshire Redstreak, to produce a light medium sparkling cider. The apples are sourced from orchards brought back to production on the Bromsberrow estate, just on the edge of Gloucestershire. Severn Cider, Medium Sparkling Perry, 330ml. This light, sparkling perry is made mainly from Blakeney Red pears. The pears originate from the village of Blakeney, just up the road from Severn Cider on the west bank of the river. Jolter Press, Blakeney Red Perry, 500ml. Our second perry, from the Jolter Press, provides some seasonal fun comparing the two. Also made from Blakeney Red Pears, apparently also used as dye for soldiers’ khaki uniforms. Purely Pickled Eggs in Spicy Cyder, 360g. Part of our British food heritage, pickled eggs are enjoying a revival with new followers tempted by the variety of flavours brought to us by Sue and her pickling team. 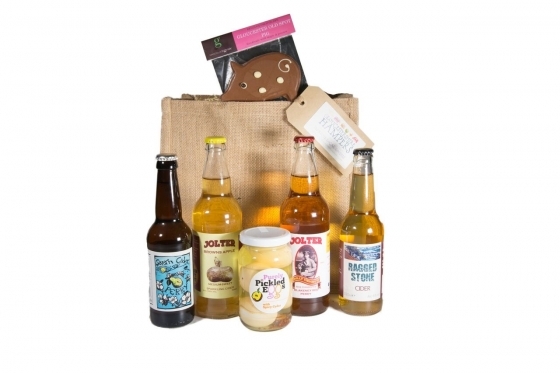 Using only British free range eggs our choice for this hamper is the warming, spiced apple cider. Chocolate Tree, Belgian Chocolate Gloucester Old Spot Pig, 55g. Gloucester Old Spot pigs were traditionally found foraging in orchards, so our chocolate piggy is welcome in this Cider Special. Allergy Advice – Some of these products may contain allergens eg eggs, soya, milk, nuts, mustard, etc or be made on premises handling these ingredients. 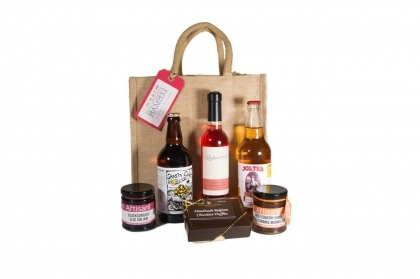 For details, please contact info@gloucestershirehampers.co.uk.